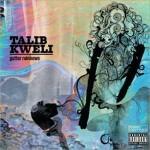 With Gutter Rainbows, Talib Kweli aims for an enlightened brand of hip-hop and succeeds, but with only a few tracks; the rest form a mixed bag of mediocre mainstream efforts seemingly plucked from a generic album blueprint. Gutter Rainbows, the first song on the album, does an admiral job of introducing the record's themes of finding the optimism and beauty among despair. Unfortunately, the track's insight and quality will not be matched until Cold Rain, seven songs later. For an album with thoughtful ambitions, it contains several uninspired boast tracks. While such cuts remain a staple of the genre, an evolution of the practice of signifyin' at the roots of rap, Kweli has shown an interest beyond self-promotion. Palookas and I'm On One are the worst culprits, and, to a lesser extent, Wait For You and Self Savior, the difference being the latter pair are simply better songs. The former make the album sound insecure, as if Kweli felt a need to defend his style and temper his indie-intellectualism with mainstream posturing. Mr International is another dud with a side of cheese. The R&B, pseudo-soul hook is artery clogging and vamps for the entire last minute of the 3:36 offering. At one point, Kweli, desperate to fit in the verbose verse, actually overlaps the hook. Tater Tots most wholly represents the album's general short-comings. It begins with an ingenious reference to the album's title and theme through the recording of a woman who believes that water's natural prismatic properties are actually a result of chemicals in the water supply. But then Kweli launches on a breathless vignette of a wounded army veteran who meets a waitress and ends up in the middle of a firefight in a Las Vegas motel lobby. Huh? What begins as a poignant struggle of a vet reacclimatising to civilian life devolves into an absurd and irrelevant action scene. Ain't Waiting and Wait For You are also strong tracks. Ain't Waiting's 70s-style disco beat and series of fairy tale allusions are good, catchy fun. Wait For You showcases a Kweli confident with his style and countering his critics: “Some say it's only eggheads that I cater to / Then wait a few in order to make an omelette I gotta break a few;” the album could have seriously benefited from more tracks with such commitment. Ultimately, Gutter Rainbows disappoints, not so much for what it is, but for what it advertises to be and most of all, what it could be. After four solo albums and acclaimed collaborations with Mos Def and Hi-Tek, one would expect Kweli to take bigger risks or at least perfect his formula. Gutter Rainbows instead hovers between a mainstream and an indie vibe, embracing neither and potentially isolating both audiences.